Happy face spiders (Theridion grallator) are found on the islands of Oahu, Maui, Molokai and Hawaii. These spiders carry distinct markings on the back of their abdomen in the shape of two small eyes and a large smile, i.e. a "happy face." Although happy face spiders are found only on the four islands, they mate freely, and are part of a large population. Male happy face spiders leave their webs and roam in search of a female spider for reproduction purposes. To aid in the task of finding a mate, the male spider will use its sense of smell to confirm that the female spider is of the same species and ready to mate. He approaches the female carefully and signals his interest to mate by using stridulation, which is a means of producing sound by rubbing two body parts together. Males proceed with caution and present courtship rituals to the female. The male spider dances, jumps, and entertains the female, with hope that she will agree to mate. Male spiders also will produce specific vibrations on the females web, alerting her that he is interested to mate. This courtship behavior is meant to seduce and hypnotize the female happy face spider. Females will accept the offer to mate when they are ready. Sometimes, the female spiders will reject the male, eating him before mating begins. Successful courtship gestures by the male will prevent the female from consuming the male spider. After a successful courtship dance, and the female agrees to mate, the male spider will continue to live and mate with other females in the future. The male happy face spider ejaculates onto newly spun sperm webs. 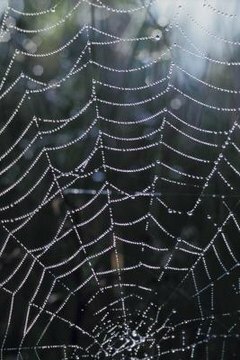 The spider then transfers the sperm from the web to the top of their pedipalps, a syringe-like structure attached to the male's body. The male injects sperm into the female's epigyne, genital opening, using the tip of the pedipalps that holds the sperm. The female happy face spider lays up to 250 eggs at a time. She places the eggs in silk brown-toned sacks and attaches them to the web. The female spider guards and protects the eggs from predators, while the eggs transition through all larval stages and ultimately hatch spiderlings. When first hatched, spiderlings look like smaller versions of the adult happy face spider. The spiderlings feed on insects that are caught in the web. As the spiderlings grow, they will shed their exoskeletons, which will happen several times throughout their lifetimes.